Here at KeyMe, we’re all about simplicity. How something can be improved…what’s the better option…how will that help our customers? Recently, our love of helping people’s daily experiences has been directed towards partnering with the new, innovative maid-booking app, Get Maid! As the makers of the KeyMe key duplicator app for iPhone and Android, we are always on the lookout for useful services and partnerships that can improve the lives of our customers. That’s why we are so excited about partnering with Get Maid. 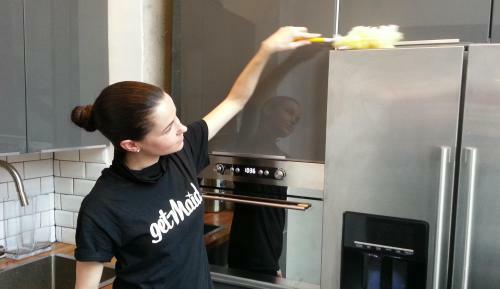 An on-demand premium service, Get Maid is an NYC startup that provides an easy way for the busy New Yorker to book a maid via the web or through the Get Maid Android and iPhone app. If security is what you’re concerned about, rest easy knowing that every maid working for Get Maid has gone through extensive background and reference checks, while being inspected for quality, training, and consistency. So, where does KeyMe come in? With our new partnership, any Get Maid customer who doesn’t have a doorman will never have to worry about making sure they’re home to let the maid in. By downloading the KeyMe key maker app, users will be able to quickly and easily share their keys securely with Get Maid, who would then provide the key to the designated maid. CLICK HERE TO DOWNLOAD THE KEYME KEY MAKER APP TODAY! Copying and sharing your key with Get Maid while booking would come at no extra cost, and if you’re worried about security again, keep note that your key would be kept safe by Get Maid in between service visits. Just one more way to help the always-busy New Yorker get through their daily grind. What do you think about Get Maid and the new partnership with KeyMe? Comment and let us know!